The 1906 Grand Prix de l’Automobile Club de France, commonly known as the1906 French Grand Prix, was a motor race which is regarded as the first ever Grand Prix. It was held on 26 and 27 June 1906, on closed public roads outside the city of Le Mans. The Grand Prix was organised by the Automobile Club de France (ACF) at the prompting of the Frenchautomobile industry as an alternative to the Gordon Bennett races, which limited each competing country’s number of entries regardless of the size of its industry. France had the largest automobile industry in Europe at the time, and in an attempt to better reflect this the Grand Prix had no limit to the number of entries by any particular country. The ACF chose a 103.18-kilometre (64.11 mi) circuit, composed primarily of dust roads sealed with tar, which would be lapped six times on both days by each competitor, a combined race distance of 1,238.16 kilometres (769.36 mi). Lasting for more than 12 hours overall, the race was won by Ferenc Szisz driving for the Renault team. FIAT driver Felice Nazzaro finished second, and Albert Clément was third in a Clément-Bayard.Paul Baras of Brasier set the fastest lap of the race on his first lap. He held on to the lead until the third lap, when Szisz took over first position, defending it to the finish. Hot conditions melted the road tar, which the cars kicked up into the faces of the drivers, blinding them and making the racing treacherous. Punctures were common; tyre manufacturer Michelin introduced a detachablerim with a tyre already affixed, which could be quickly swapped onto a car after a puncture, saving a significant amount of time over manually replacing the tyre. This helped Nazzaro pass Clément on the second day, as the FIAT—unlike the Clément-Bayard—made use of the rims.Renault’s victory contributed to an increase in sales for the French manufacturer in the years following the race. Despite being the second to carry the title, the race has become known as the first Grand Prix. The success of the 1906 French Grand Prix prompted the ACF to run the Grand Prix again thefollowing year, and the German automobile industry to organise the Kaiserpreis, the forerunner to the German Grand Prix, in 1907. Considered perhaps the 20th century’s best chronicler of English culture, the English novelist and journalist George Orwell, (Eric Arthur Blair).was Born on 25 June 1903, in Motihari, Bihar, in India, His work is marked by clarity, intelligence and wit, awareness of social injustice, opposition to totalitarianism, and belief in democratic socialism. Although Orwell wrote literary criticism, poetry, fiction and polemical journalism. He is best known for the dystopian novel Nineteen Eighty-Four (1949) and the allegorical novella Animal Farm (1945), which together have sold more copies than any two books by any other 20th-century author. His book Homage to Catalonia (1938), an account of his experiences in the Spanish Civil War, is widely acclaimed, as are his numerous essays on politics, literature, language and culture. In 2008, The Times ranked him second on a list of “The 50 greatest British writers since 1945″. Orwell’s work continues to influence popular and political culture, and the term Orwellian — descriptive of totalitarian or authoritarian social practices — has entered the vernacular with several of his neologisms, such as doublethink, thoughtcrime, Big Brother and thought police. Nineteen Eighty-Four was published in 1949. It is a dystopian and satirical novel set in Oceania, where society is tyrannized by The Party and its totalitarian ideology.The Oceanian province of Airstrip One is a world of perpetual war, omnipresent government surveillance, and public mind control, dictated by a political system euphemistically named English Socialism (Ingsoc) under the control of a privileged Inner Party elite that persecutes all individualism and independent thinking as thoughtcrimes. Their tyranny is headed by Big Brother, the quasi-divine Party leader who enjoys an intense cult of personality, but who may not even exist. Big Brother and the Party justify their rule in the name of a supposed greater good.The protagonist of the novel, Winston Smith, is a member of the Outer Party who works for the Ministry of Truth (Minitrue), which is responsible for propaganda and historical revisionism. His job is to re-write past newspaper articles so that the historical record always supports the current party line. 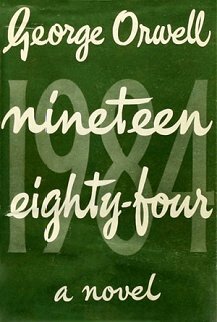 Smith is a diligent and skillful worker, but he secretly hates the Party and dreams of rebellion against Big Brother.As literary political fiction and as dystopian science-fiction, Nineteen Eighty-Four is a classic novel in content, plot, and style. Many of its terms and concepts, such as Big Brother, doublethink, thoughtcrime, Newspeak, and memory hole, have entered everyday use since its publication in 1949. Moreover, Nineteen Eighty-Four popularised the adjective Orwellian, which describes official deception, secret surveillance, and manipulation of the past by a totalitarian or authoritarian state. In 2005 the novel was chosen by TIME magazine as one of the 100 best English-language novels from 1923 to 2005. It was awarded a place on both lists of Modern Library 100 Best Novels, reaching number 13 on the editor’s list, and 6 on the reader’s list. In 2003, the novel was listed at number 8 on the BBC’s survey The Big Read. Animal Farm is an allegorical novella which was published in England on 17 August 1945. According to Orwell the book reflects events leading up to the Russian Revolution of 1917, and then on into the Stalin era in the Soviet Union. Orwell, a democratic socialist, was a critic of Joseph Stalin and hostile to Moscow-directed Stalinism, especially after his experiences with the NKVD and the Spanish Civil War. The Soviet Union he believed, had become a brutal dictatorship, built upon a cult of personality and enforced by a reign of terror. 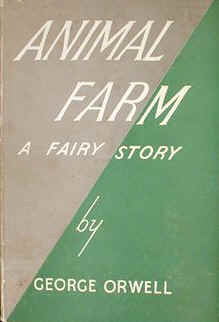 In a letter to Yvonne Davet, Orwell described Animal Farm as his novel “contre Stalin” and in his essay of 1946, Why I Write, he wrote that Animal Farm was the first book in which he had tried, with full consciousness of what he was doing, “to fuse political purpose and artistic purpose into one whole”.The original title was Animal Farm: A Fairy Story, but the subtitle was dropped by U.S. publishers for its 1946 publication and subsequently all but one of the translations during Orwell’s lifetime omitted the addition. Other variations in the title include: A Satire and A Contemporary Satire. Orwell suggested the title Union des républiques socialistes animales for the French translation, which recalled the French name of the Soviet Union, Union des républiques socialistes soviétiques, and which abbreviates to URSA, the Latin for “bear”, a symbol of Russia.